I just wanted to post these cute pictures of Reddin having his last bottle. This was on New Year's Eve night. Redd REALLY loved the bottle, and I wasn't sure how it was going to be trying to break him of it. 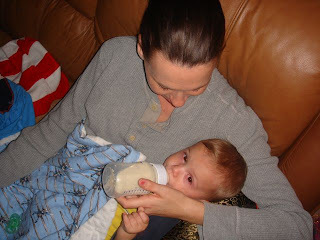 Mattie really didn't care too much about her bottle by the time she was one year old, but Reddin really enjoyed cuddle time with his bottle before his naps. My goal with both kids was to have them broken of the bottle within a week of them turning one. It was a cinch with Mo, but I was nervous about Redd. Plus, I really was scared I would be giving up cuddle time, with him giving up the bottle. I stuck with my goal though, and he was fine. I sat down with him, knowing it would be his last bottle, and I fully enjoyed watching him and contemplating the first year of his life. I couldn't believe how fast it had flown by. I am happy to report that my little guy still loves cuddle time, although its with a sippy cup now! Those photos are so sweet, cuddling is the best. Jonas has never been much of a cuddler, but if I catch him in the right mood I can get him. Of course Makai's usually up for it. Reddin really did hit that 1-year mark fast! my first two were easy to switch from bottle to sippy cup at 1...but Ruthie however did NOT adjust. Actually we JUST switched her to a sippy cup, finally, about 2 weeks ago. Reddin looks so content in those pics, & so do you:) Very sweet. Ah, cuddle times the best! I can't believe he's 1 already, and such a cutie!!! Ahhhh, cuddle time is wonderful!